The newly released Trisul APP Suricata EVE allows you to easily integrate Suricata alerts. You can give that a try if you prefer Suricata. All you have to do is start snort with the correct options. Trisul automatically picks up the alerts. Select the “How to start snort” to get the command line options as shown in the screenshot. You can then copy-paste that into a terminal. Barnyard2 is a software that takes the workload of translating to various output formats away from Snort. You can have it write to multiple outputs. 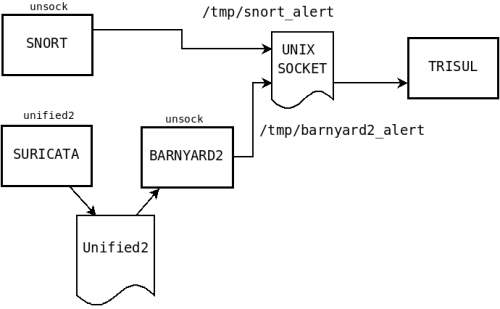 Trisul can connect to barnyard2 using the alert_unixsock output format which is supported by barnyard2. All we need to do now is to run barnyard2 to read the unified2 files and send alerts into the Unix socket. Edit barnyard2.conf and add the alert_unixsock output option. UPDATE: We now recommend using the new EVE alert format for Suricata. Please follow instructions in How to get Suricata EVE alerts into Trisul Network Analytics? First edit the suricata.yaml file and check if Unified2 logging is enabled. You can disable all other logging. Next start suricata and have it log to the /tmp/byin directory((byin – just a convention for barnyard input directory, You can use any name you want)). This will cause suricata to write files of the form unified2..log in the /tmp/byin directory. A diagram that shows the relationship between the various pieces. The default install of every Trisul Probe listens on a unix socket at /usr/local/var/lib/trisul-probe/domain0/probe0/context0/run/snort_alert You can change this by editing the IDSAlert/UnixSocket parameter in the config file. A new tool called importpcap_ids uses snort to run the normal Analytics as well as IDS over PCAP dumps. The optional context= argument allows you to create multiple separate datasets in Trisul.